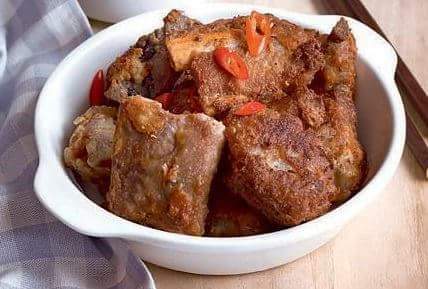 Place pork ribs in a pot and cover with water. Season with salt and pepper. Boil until meat is fork-tender. Drain and set aside. Mix together salted egg yolks, flour, cornflour, baking soda, milk, butter, sugar, salt, and pepper. Heat oil in a heavy-bottomed pan. Dredge pork in batter and fry until golden brown. Drain on paper towels. Transfer to a platter. Sprinkle with chopped chili and serve with garlic potato wedges.